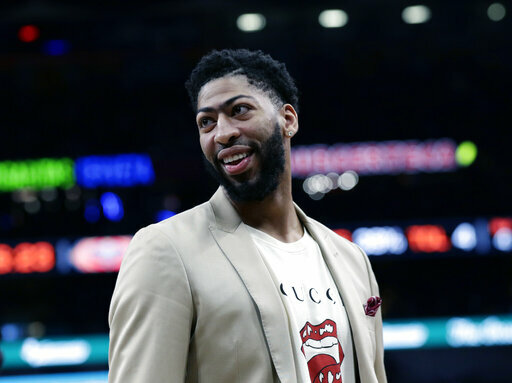 NEW ORLEANS (AP) — Anthony Davis didn't need long to win back the crowd after being booed during his pregame introduction and the first few chances he had to handle the ball. 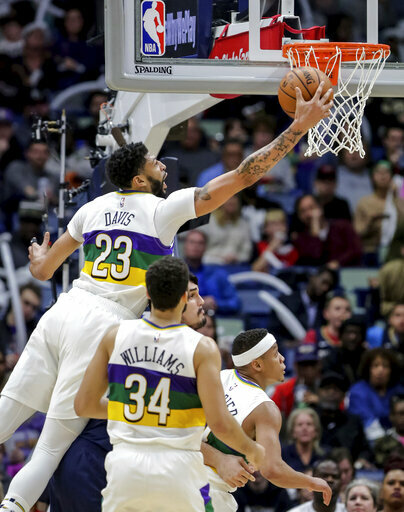 But the Pelicans sought to close out a tight game without Davis on the court anyway — and narrowly pulled it off. 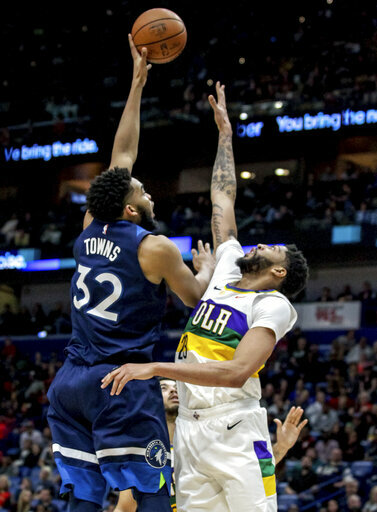 Playing for first time since asking to be traded, Davis had 32 points, nine rebounds and three blocks in 25 minutes, and the New Orleans Pelicans beat the Minnesota Timberwolves 122-117 on Friday night. Davis said hearing boos surprised him a bit and was "definitely awkward," but added, "That's life, man. Some people aren't going to like it. I worry about playing basketball." "I just love the game, love playing," Davis continued. And as he glanced around the locker room, he added, "Me and all these guys in here have a special relationship. And so obviously I want to be on the floor with them. They wanted me on the floor. And it was as simple as that. 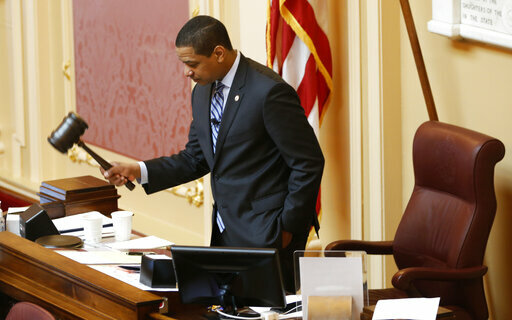 "The other stuff, the outside noise, Twitter rants, it's all good," Davis said. "It doesn't bother me. I want to play and being able to go out there and to be able to play the game I love for 25 minutes, it was fun." 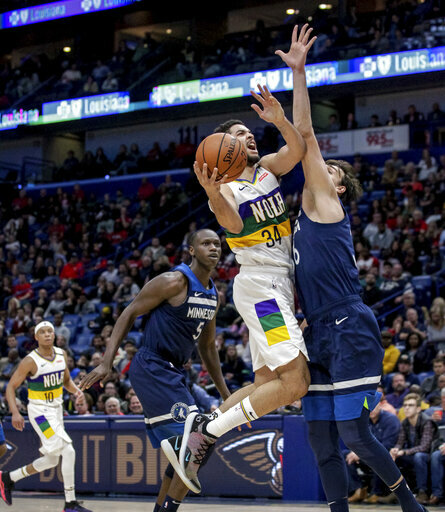 Jrue Holiday had 27 points and nine assists and Kenrich Williams had 19 points — and they led the Pelicans' offense in the fourth quarter, when Davis was kept on the bench despite the teams being separated by as little as one basket several times in the waning minutes. Gentry said he limited Davis' minutes because Davis had not played since spraining his left index finger on Jan. 18. "I was not going to have him — first game back — play 38, 40 minutes," Gentry said. "We had talked about playing between 22 and 25 minutes. That's why he didn't go back in the game. I thought he played well the minutes that he was in there and did a great job. He was typical Anthony." 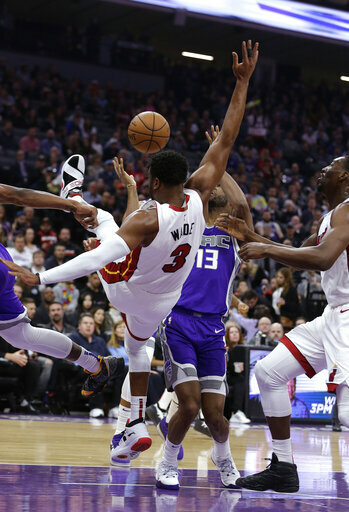 Instead of playing Davis, Pelicans coach Alvin Gentry sent in Julius Randle, who came through with a pair of inside baskets and clutch free throws in the final minutes. "I guess he's giving a lot of people a chance to finish out games and be in important positions," Holiday said. "Overall, it was a good win." Karl-Anthony Towns scored 32 points for Minnesota, which dropped its fourth straight. 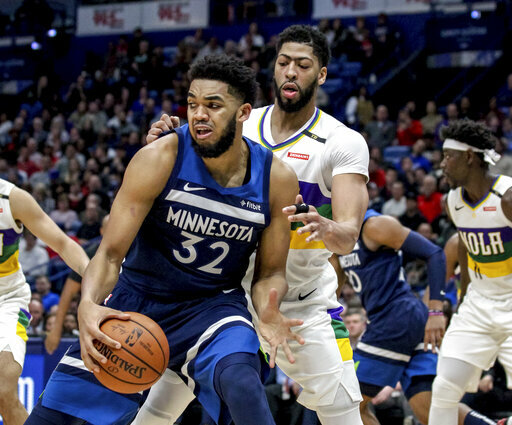 Towns shot 12 of 20, made four of five 3-point attempts, and his driving dunk pulled the Timberwolves as close as 114-112 in the final minute. But Randle responded with one of his late baskets inside and then rebounded Towns' missed jump hook with 16 seconds left. 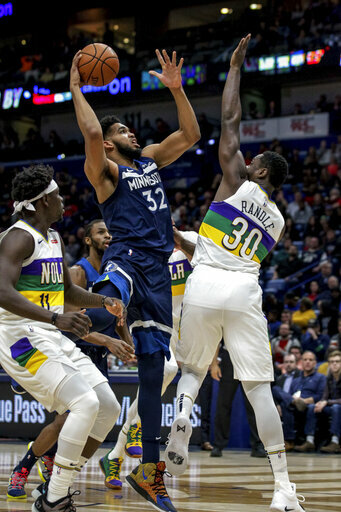 Andrew Wiggins had 23 points, 10 rebounds and seven assists for Minnesota, which shot and rebounded marginally better than New Orleans, but was outscored 27-16 at the free throw line. The Pelicans also had a 28-7 advantage in fast-break points, helped by Minnesota's 16 turnovers, which led to 24 Pelicans points. The Timberwolves were playing their third straight road game and were coming off a loss Thursday night in Orlando. 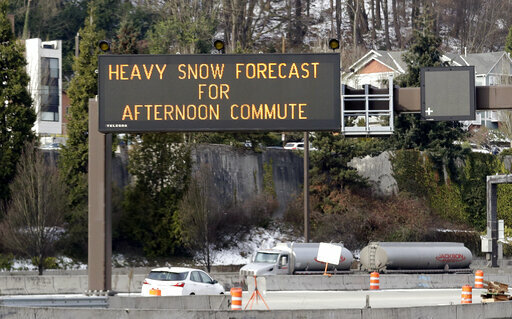 "It has been a long road trip. Guys are fatigued and banged up, trying to figure out a way to win," forward Taj Gibson said. "We came real close; we just didn't have enough to pull it off." Randle and Time Frazier each scored 12 points for New Orleans, which has won two straight. Timberwolves: Jerryd Bayless sat out with soreness in the big toe on his right foot. ... Jeff Teague was available coming off the bench after missing eight games with a left foot injury. He had 12 points, five assists and four rebounds in 17 minutes. Isaiah Canaan also scored 12. Pelicans: Randle finished with 12 points. 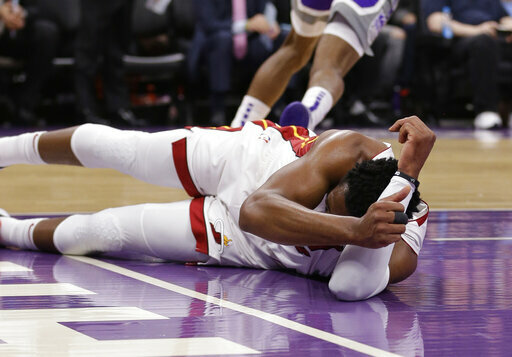 Center Jahlil Okafor sat out with a left ankle sprain that occurred late in New Orleans' victory at Chicago on Wednesday night. 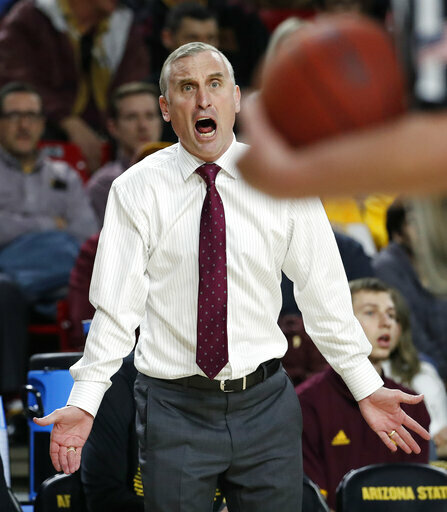 ... Guard E'Twaun Moore also was ruled out shortly before tipoff with a left thigh bruise that also had sidelined him the previous five games. Davis looked determined from the outset to justify his continued presence on the court, however awkward it may be for a franchise that had seemed inclined to move on without him. 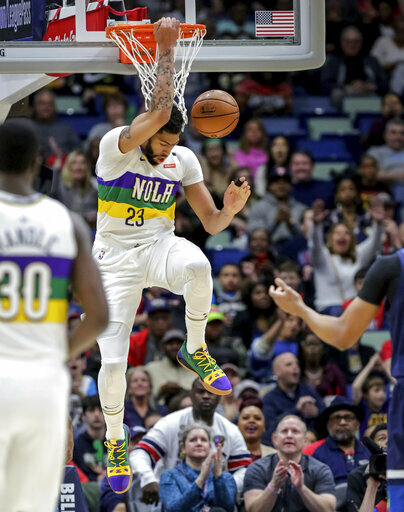 Pressured by the NBA not to sit a healthy star they had refused to unload by Thursday's trading deadline for this season, the Pelicans announced that Davis would return to the starting lineup. He scored 10 points in the first seven minutes. 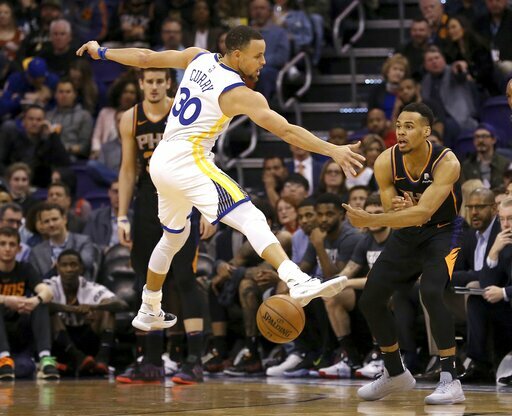 In the opening minutes, he went strong to the rim while being booed and dunked, at which point a segment of the crowd cheering largely drowned out the boo-birds. 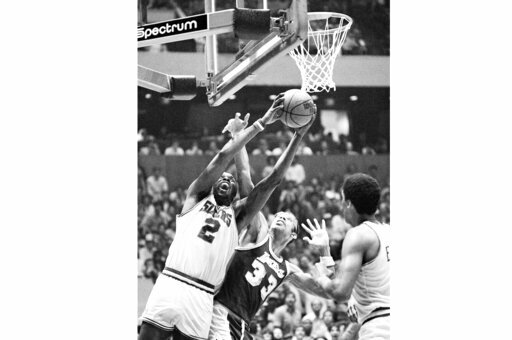 Later, as Davis stood on the foul line taking free throws, part of the crowd booed while others chanted, "A-D, A-D!" By halftime, Davis had 24 points and his highlights included a reverse alley-oop tip at the front of the rim while being foul and crashing to the floor on his back. 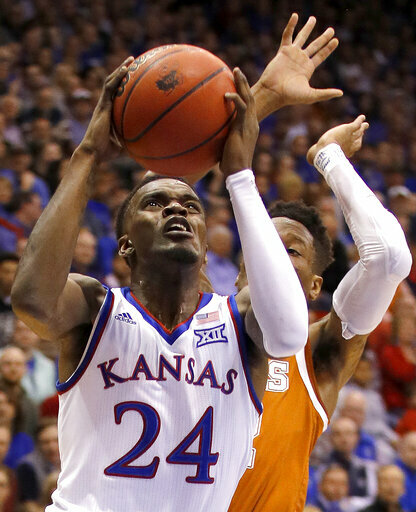 Davis was fine, and reached the 30-point mark before the middle of the third quarter. "The most important thing is just we got the win, guys played hard, guys played together," Davis said. "I'm going to do everything I can. You know, I'm always going to remain professional at the end of the day. And any time I step on the floor, I want to be the best player I can be." "It's kind of hard to boo somebody when he had like, 30 points in 20 minutes," Holiday said about the way Davis won over the crowd. Timberwolves: Host the Los Angeles Clippers on Monday night. Pelicans: At Memphis on Saturday night.